Can you tell I’m all about one dish meals at this stage of pregnancy?! Quick and easy prep, cooking and clean up are my number one goals in meal planning right now. This is another recipe I grew up eating and it remains a family favorite- though I’ve modified it some to use store-bought ingredients. Growing up, my mom never bought beef from the grocery store, and she rarely bought vegetables. My grandparents kept us supplied with meat from their cattle along with fresh, frozen, and canned veggies from their gardens. 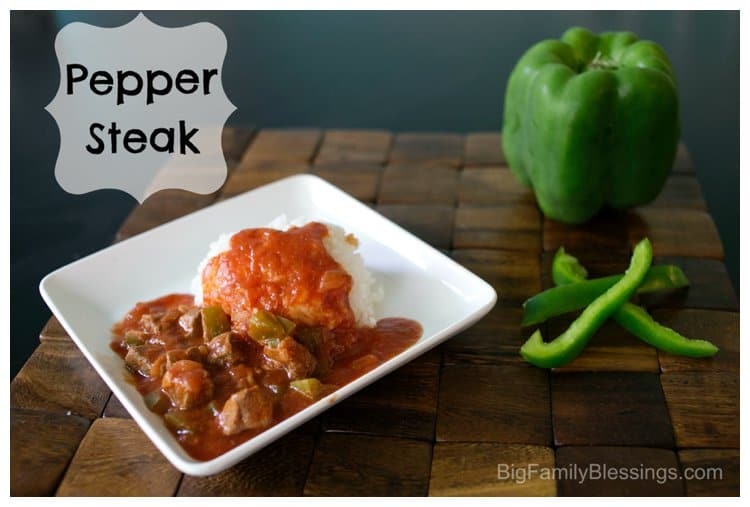 Mom always made this dish with Papa’s beef and my Grandmothers’ canned stewed tomatoes and frozen peppers. Feel free to change the cut of meat in the recipe. I use whatever I find on sale or in my freezer; most often a roast cut, london broil or sirloin. Brown the cubed meat, onion and garlic in a small amount of oil. Stir in broth, soy sauce, and both cans of tomatoes. Allow the mixture to simmer for 15 minutes. Add the green peppers, cover and simmer another 20 minutes or so. Vary this time according to how done you prefer your peppers. I like to simmer less time for crunchy peppers, while others may prefer soft, tender peppers. Blend the cornstarch and water in a small measuring cup. Slowly pour the mixture into the Pepper Steak, stirring constantly, until the mixture thickens and boils. Add salt to taste- I find that I rarely need to add salt due to the broth and soy sauce. My favorite growing up! So easy and so delicious.